Two years on and it’s all starting again…. One of Anon’s brown ceramic egg found by Nicola White near Cliffe, Kent. Today heralds in the start of the new trout fishing season so I wish all you fluff chuckers many tight lines and memorable outings. 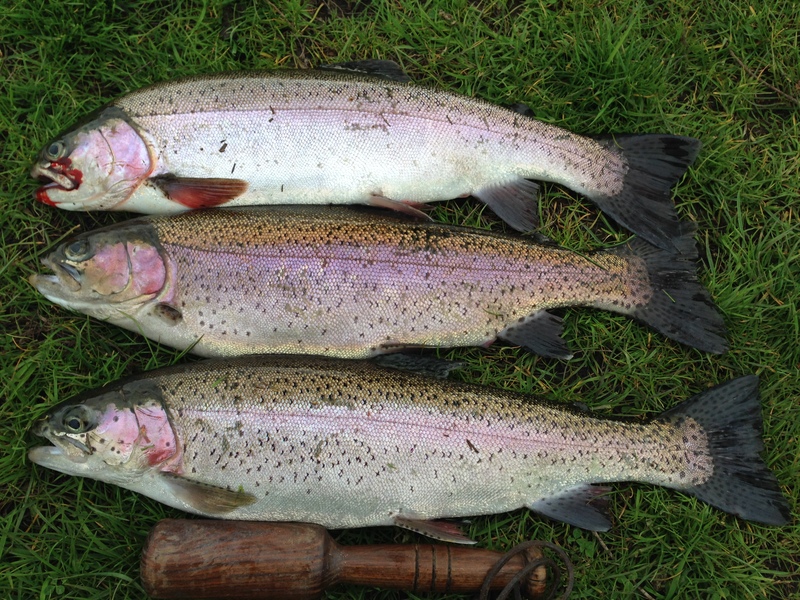 Late this afternoon after telephone calls, emails and meetings i took to the water to land these three fish. Having observed the water and the retrieves of fellow fishers it was a level of counting down before starting a swift retrieve. Also in case you thought the ceramic egg saga was all over, I can inform you more have been found. So two years on from their release on the tidal Thames they seem to be being washed up again further down towards the estuary. Yes, two years have passed since the start of the egg saga and yes they are still out there to be found. 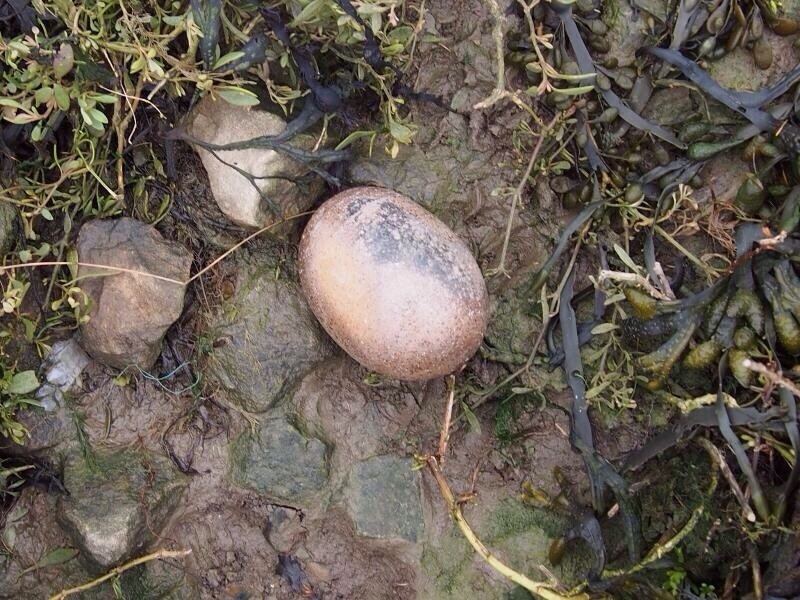 On the shoreline of Cliffe in the County of Kent it has been reported that a brown glazed ceramic egg of 4 inches in size, unmarked but rattled was found by mudlarker, Nicola White. Whilst scouring the foreshore for artifacts this egg was stumbled upon amongst the seaweed and usual high tide debris. What is more intriguing is the art made by the Nicola White the lady who found this egg. I can’t wait to find out more about the mudlarking finds and art she creates. Early this morning a brown envelope landed on the mat, it contained a consignment of 18 buzzers in three patterns. 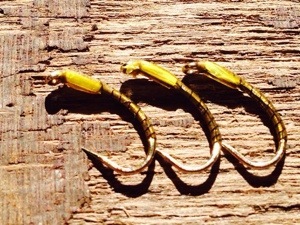 Each fly impeccably dressed, and should deceive the most discerning trout in order to entice a solid take. 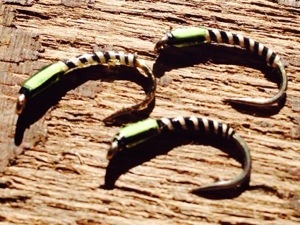 At the start of this new trout season the warmer than average temperatures should see the pupae, nymphs and buzzers show in abundant numbers. I wonder which of the patterns will get the most interest. It’s all in the anchor point…. As an invited guest of Farlows of Pall Mall I attended a mornings spey casting lesson held on the foreshore in Putney. At 10.30am on this sunny March morning twenty or so gentlemen descended on the bank of the River Thames to try out a range of Guideline salmon rods and shooting heads. Under the watchful eye of Jan Erik Granbo, Guidelines Pro Instructor were entertained to an hours lesson on how to cast a salmon line and shooting head some considerable distance. Using a range of rods and lines he demonstrated how to cast effortlessly using the ‘anchor point’ method. With what seemed to be effortless action and little arm movement, Jan cast most of these lines out with precision and power. In 18 years Guideline have become a brand to be reckoned with. Today we put the Power Taper, Compact RTG, Power Taper, Scandi and Power Taper, Skagit RTG through their paces. These proven shooting heads in varying tapers and densities developed in Scandinavia offer a diverse and workable system for the fly fisher to use and adapt quickly to changing conditions. The mornings activity was hosted by Farlows of Pall Mall. With Sean Clarke,Tom Festing, and Richard Kingston on hand along with the Pro Team from Guideline there were plenty of tutors to help you through the task of casting these lines out behind Fulham’s Craven Cottage on the Thames near Putney. At low tide lines were being cast from a range of rods, my favourite was the LXI 13’9″ 9/10. This rod has a sweet action and fast tip but felt right in the hand. What Jan taught us was that the rod and line do all the work, the only real input from the fisher was to ‘anchor’ the action in towards your belly button with the bottom hand. Your top hand on the Handel is simply resting the rod, the bottom hand pulls aggressively in towards the torso, this punches out the line towards the treetops. By aiming at the treetops my line would punch out a fast and tight loop. The most versatile line was the Power Taper Compact RTG followed by the Power Taper Skagit RTG. The difference between these lines with pre looped ends. The Compact Line is suited to small to medium rivers, tracking well in the wind and turns over easily. The lines I tried today were the INT/S1/S2 and floating 550grains/35gr. Without question this took Spey Casting to a new level for me. With thanks to Jan Erik, Richard, Sean and Lawrie for today. 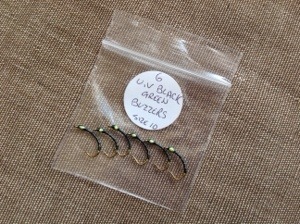 It’s that time of year again when buzzers are the staple diet of trout on still waters. Especially those still waters that run deep. 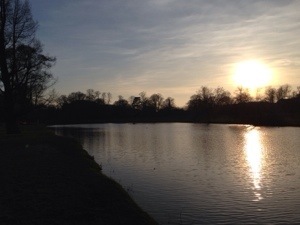 On a recent trip to the Albury Estate, Syon Park Fishery most of the catches last week were to buzzers, pheasant tail, damsels and other nymph, pupae and emerger patterns. Last season I purchased some fabulous flies tied by a fly fisher from Leeds, the quality of the materials used and tying were sublime. Again this season I will start with several patterns from this artisanal fly-tyer of what I think are the best buzzer patterns on the market. I have decided to seek out flies from a group of UK and one Polish fly-fishers, where their skill and quality of work surpasses anything you can buy in your average tackle store. 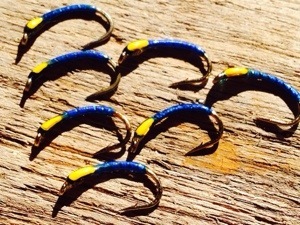 Over the next few days I will feature some of these flies. Today is the last Friday of the coarse fishing season being the 16th March, however we are now only days away from the start of the official trout season. 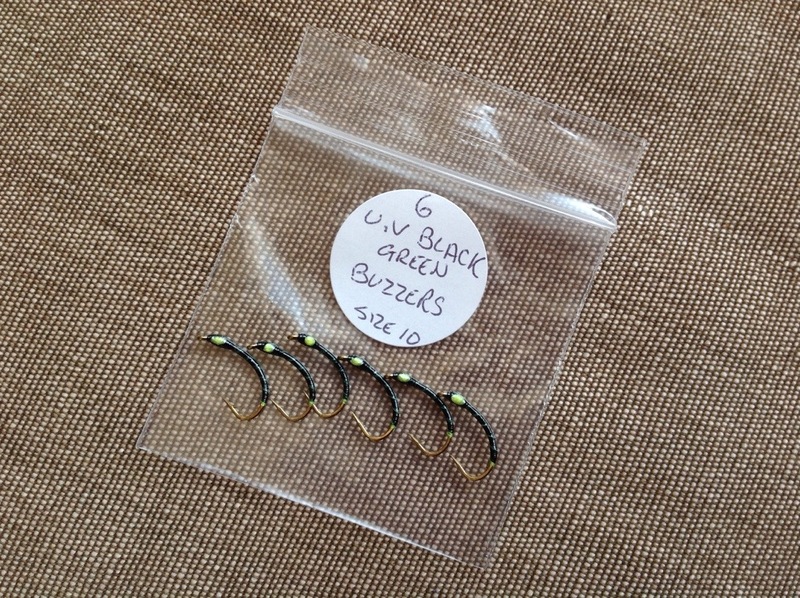 With lake fisheries offering all year fishing I am going to take a couple if hours out on the warm sunny March day to visit The near by Syon Park Fishery to try out some recently acquired black and green buzzers. 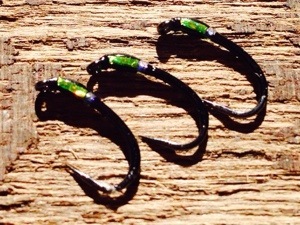 These well tied flies have UV cheeks so I hope they will attract the eye of a passing fish. I’ll update my post later with a report on their ability to catch fish. Wherever you are today enjoy this last day of the season and may I wish you tight lines. It’s nearly the 16th of March! A day when the brotherhood of fishermen take to the water in a bid to catch that personal best before the rods and reels are laid to rest. Go forth and fling your hook…. A gathering of the brotherhood…. In a distant corner of the land there was a gathering of the brotherhood of fishermen and ladies in a hall in Romsey. There, knowledgable folk presented the wares of times past when tweeds were worn and hats adorned the grey matter. This was a gathering of dealers, collectors and those that have the illness known to many women of piscatorialitis, where one rod, reel, float or fly is never enough. On the outskirts of this Hampshire market town signs adorned the lamp posts to guide those with a passion for angling to see refuge in a school hall aided by cups of ‘victory gin’, builders tea and to exchange thoughts and knowledge on angling and all that is associated with it. There were the familiar faces of John Andrews of Andrews of Arcadia, Jeff Della Mura, author of Hooked on Floats, Richard from Robins Wood Fishery, James Partridge of Jim’s Reel Shop, David Townsend of Fishing Tackle Antiques, Michael Fanner of The Reel Thing this list was extensive in the who’s who of vintage tackle or as my wife would term it stuff from those that have flung their last cast….now in fishing heaven. 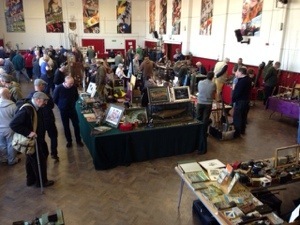 Tables were full of vintage tackle, books, ephemera, cased fish, landing nets, flies, collectables and a fine assortment of ‘sticks’, fly and coarse fishing rods to those of the passion. Fine leather boxed Hardy Perfects, Allcocks Aerial and Populars, Speedias, Trudex, Rapidex, Ambidex and many other classics filled tables along with cases of Classic Abu 6000 multipliers. There were classic rods that have graced the Test and Tay, those that have rested on the banks of the Avon and Frome, now the rest on the finest cotton velvet with prices ranging from under £50 – £850. 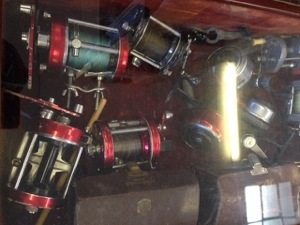 The assortment of rods available covered every need and made from those bastions of the hay day of Redditch to the House of Hardy in Northumberland, custom built rods by Barder to one from that eccentric dealer Ben Maurice Jones who once traded from a shop in Portobello. Sadly like many of the classic fishing tackle shops that nestled in the streets of London and other metros is now nothing more than a memory. For those of you that suffer from the incurable ailment of hoarding tackle there is another fair to be held in Redditch on Sunday the 11th May. My only however was the purchase of a small brass and steel priest for Young Tales. On my journey home via Winchester I stopped off to pick up a pair of vintage Keenfisher studded waders I had purchased via that well known online auction site, they were a bargain and in nearly new condition. 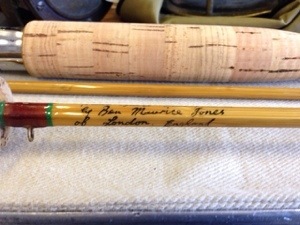 What I did do as promised was not to buy anymore ‘sticks’ for fear of being beaten by with them upon return to thee Tales household…..it was very difficult as I did see a fine roach rod not to forget the fine split cane fly rod by Ben Maurice Jones for £150.00 or the bargain of the day was a fine roach rod by W B Clarke of Redditch for a mere £38 made of two parts cane with a split cane top, it was in magnificent original condition and sold by Michael Fanner of The Reel Thing…oh how I could kick myself for not buying it. After several months of rain the skies gave way to allow the sun to shine. Having undertaken the normal Saturday morning activities there was still time to pack a bag and head of for a few hours fishing. Young Tales has been denied the opportunity to net a fish since the winter set in. Today we were off to break the deadlock. 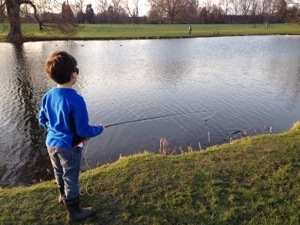 We headed down the A316 to Syon Park to the Albury Estate run fishery at This historic venue where clear blue skies, clean warm light and a breeze greeted us. 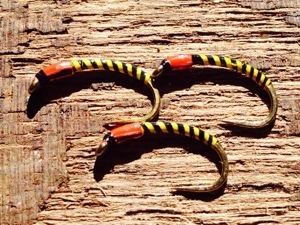 Young Tales made a choice of fly and opted for a dependable Montana nymph. After a good 20 minutes and no follows or takes we changed fly to a goldhead and deer hair bodied nymph that was given to us by Mark Minshall our fellow blogger on wordpress. He does tie exceedingly good flies. Having been spotted fishing near the bridge by young Tales we exchanged greetings as we had not seen each other since the back end of last year. Mark kindly gave us a fly that he had previously caught two fish on. After having tied it on and fished for a while there was no movement in the water. Mark had packed up for the day and headed home along the bank. No sooner had he turned away we had a good old tug on the fly but unfortunately I didn’t set the hook so our silver bar managed to discard the fly quickly. The breeze dropped off and the lake became a dark pool reflecting the evening sky, trout rose in front of us but none were to follow our offerings. The only thing I hooked was the rather large tree to my right which confiscated my bloodworm fly. What we did witness was the capture of two large rainbows in excess of 8lb and one 6lb brown, taken on a black damsel nymph. Clearly there are good sized fish in this fishery and if presented with the right fly and the ideal rate of retrieve will happily take. All in all an enjoyable afternoon even if we did blank, however we will return with more knowledge of how to fish this water. With thanks to Mark for his kindness, we look forward to more fishing adventures. 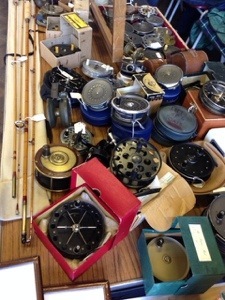 Tomorrow is the Romsey Vintage Tackle Fair so I will cover this in Monday’s post. 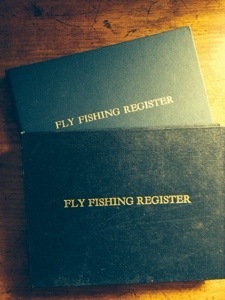 Whilst acquiring a few new book for my collection and reference I stumbled upon two Fly Fishing Registers on that infamous online action site. Offered by a book dealer from the South Coast I thought these would give an interesting insight into fishing on the Nadder, Itchen, Test and Broadlands Estate. I was happily surprised to see listings in the register of excursions to the River Exe and other waters, especially those that I haven’t fished. What was more interesting in the narrative was to find one of the registers was written by a lady and indicated that most of her fishing companions were ladies. One fellow fisher was a gentleman by the name of Bryan Cook and a dog called Jonathan (Jon Jon). The registers cover the seasons from 1985-1991, the blue and guilt hard cover bound register a gift from Charles to his Gran dated Christmas 1987. The narrative started with a fishing trip to the River Exe at Cove on the 23rd of August. The fishing companion for this trip was Gill. They stayed at the Bank House Hotel near Oakford Bridge and acquired their licenses from a fishing tackle shop called Launce Nicholson. This trip lasted for two days however having both hooked fish at 11am and then lost them no salmon were recorded as caught. The detail of the register indicated the fish fell to a Muddler Minnow. Having seen several fish over the two days the second day listed the river as ‘out of order’ due to gravel exstraction. On August the 30th our writer of the register fished with Gill on beat 3 of the Nadder catching a rainbows (2lb) and a brown trout (2.2lb), quoted as Gill’s 2R’s, these fish falling to a BWO. The following day our author detailed another trip on the Nadder (beat 4) with a fishing friend by the name of Nancy, on that day a brown trout of 3.8lb was taken by the author on a ‘thingy nymph. Within the register there are listing of flies used. The most prominent being, BWO, Lunn’s , Greenwell’s, Hawthorn, Shrimp, G.R.H.E, P.T, Sedge, Red, Sherry and Claret Spinner,Culs Mayfly, Black Nymph and Equalizer. 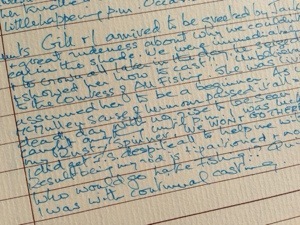 There are characters that I wish I could meet who are listed in this register, Gill Wood, Nancy, Joanne, Lizzie Rouse, The Countess, Charlie, Bryan Cook and Jeremy P.
I will over the coming weeks post more extracts from these fascinating diaries of fishing during those heady days of the mid 80’s and early 90’s.